It wasn’t too long ago that we were at the National Sports Collector’s Convention in Cleveland, OH – and we made this incredible purchase. In a previous post, I discussed the benefits of arriving early at The National, as there are deals to be made. Let's take a look back at this one. It was day one of the National for us (Tuesday), and I had taken a break from setting up the booth and I wanted to walk the floor. After about an hour of perusing the aisles, I started to head back to the booth. Then, I stopped dead in my tracks. Out of the corner of my eye, I could have sworn I saw someone with a Superman set. Now keep in mind, the R145 Superman series is incredibly rare, so I had to go see for myself. I was in fact correct – one dealer was paying off his debt to another dealer via this near-set of vintage Superman cards. It hailed from the original dealer’s personal collection, that he had stashed away for over 30 years. The dealer who was receiving the cards is actually someone I know quite well, as we have done plenty of business in the past. I had one goal in mind: buy that collection! Being that this set is essential to the majority of the collecting world, and the fact that this dealer only deals with fresh material, I knew I was going to have to leap tall buildings to get this deal done. So, I went over to the table and inquired about the cards. 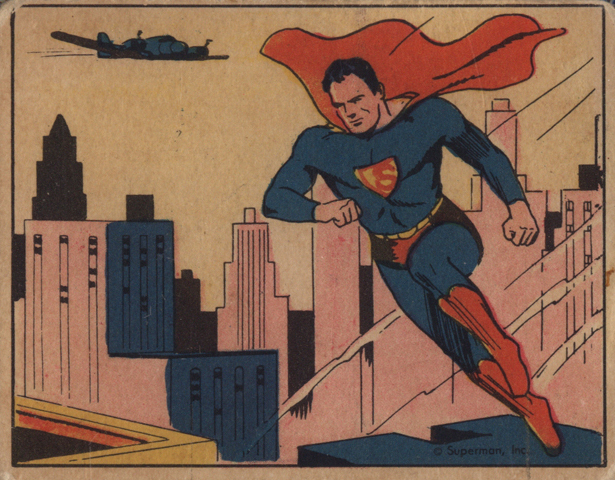 And wouldn't ya know, out comes another near-set of R415 Superman cards! So now, sitting in front of me are two, yes two, near sets of 1940 Supermans. After some back and forth negotiating, we got the deal done, and I walked away grinning ear to ear. Did I overpay? Maybe. Were the cards in the best of condition? Not really. I didn't care, because I know these cards, and I know the market. The only thing that concerned me was that I couldn't get these cards graded fast enough, and that I'd have to wait a week or two to put them up for auction. These cards sell faster than a speeding bullet. I couldn't wait to show the team back at the booth. Why are these card so good though? Well, let me tell you. Condition, rarity, and popularity are what drives the value in the market - and this set has all three. Forget about finding a Gem Mint example - that just won't happen. Of the 4,000 or so cards submitted to PSA for grading, only SIX have gotten to the MINT threshold. Truth be told, the majority of these cards grade out in the VG to EX range - and sell for hundreds of dollars. The most popular card in the set, card #1, is not readily available - in any condition. There are less than 80 examples of this card graded by PSA, and they only hit the market a few times a year. The high numbers, which range from 49-72, are also tough to acquire, causing them to sell at a premium. 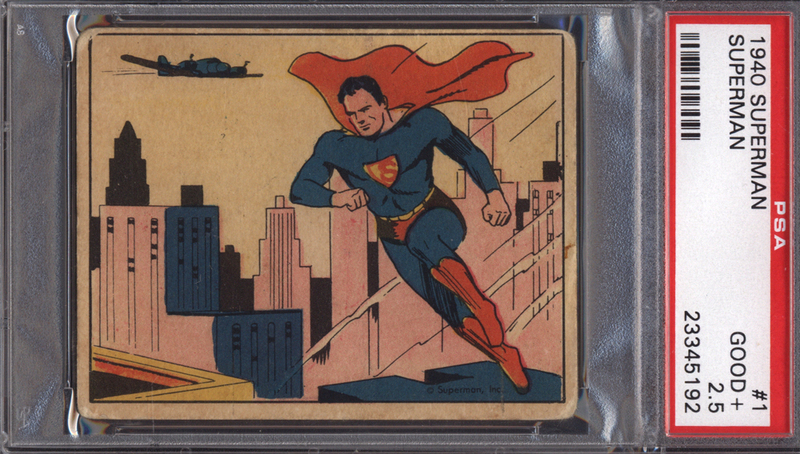 As a result, only five people are known to have a complete graded set of the 1940 R145 Superman cards. As you can see, these two Superman near-sets were a "must buy" for us. We have recently gotten the cards back from PSA, and have sold a few already at auction. We are very happy with the results, and hope to come across more Superman collections in the future. Just Collect is always buying vintage non-sports singles, sets, and collections from 1879-1979.